The skills required to write an essay are the same skills required to write a speech, to prepare a persuasive argument, to prove a point, or to explain an idea. If we can help our students acquire these skills as we teach “the essay, we will have assisted them in accomplishing truly valuable life skills. gain confidence as they begin to recognize what works and what doesn’t. 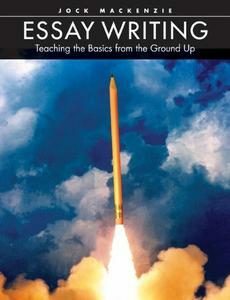 The book incorporates a wide range of innovative approaches to teaching essay writing — from how to ‘“picture and “act out’ an essay to a winning format for a topic sentence and using scattergrams to turn brainstorming into constructive outlines. Throughout the book, assessment tools and marking keys support simple marking techniques that consider not just the final essay, but effort and time on task.